ou see a man like a bear, with a superior and noticeable bodysize from nearly 7 feet. He seems to have broad shoulders and a very muscular body. Yet he seems to be a young guy, around 20 years. If you see his upper body one time without shirt, you will notice a lot scars and scared weals going down from his shoulder his back and upper arms. His face seems to be angular, you see a noticable scar on his left cheek. He haves a short beard in his face, which seems to be untended stubbly at some other parts. He haves redblond,long, slight wavy hairs which is mostly practically bounded together. Some wisps of hair seems to fall wild in his face. His cool, iceblue eyes seems to examine everything around him mostly warily and attentive. Mostly he seems to controll his own faceexpressions in a noticable way. Nearly like he trys to hide his true feelings under a mask of coolness. His thin lips seems mostly to have a smugly or cool smile on it or a crooked grins. Yet he doesnt appear unkind, he appears mostly charming, even he appears mostly cool and sceptical. On the whole he seems to be more of a wild and rough kind of beauty. All his moving seems to be heavy and noisy. Heavy steps and noise of his armour you hear, as soon he steps in. He radiats more power and strongness as dextery in all his moves. He has a straight, upright and proud posture. His movements give evidence from the body controll of an experienced fighter. 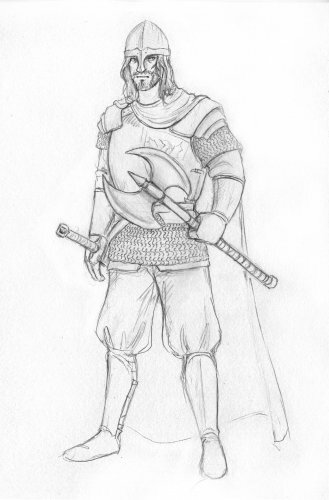 Most Erin wears a heavy armour, mostly hinden under a white robe, so you can hear only the noise of the armour. On the back of the robe you see the emblem of Runewick and the emble of the bearer of the fire. His equipment seems to be all from a very good make, even everything looks mostly a bit wrecked. ON his weapon belt you see mostly ready at last one sword under diffrent other weapons, which he carrys with him. He seems to be a real weapon fanatic. On his back you can see a big and heavy shield. If you stands near to him you will notice mostly a strong scent of wine. Erin mostly seems to have a rough behaving. He seems to be a testy person. However, most times he shows impeccable manners, first notable in presence of womans. In levity, he often seems to danger himself. Mostly he trys to solve his problems more with deeds than with words. Yet he seems to be a good speaker, if he have to be it.